Grace Wales Bonner is an academic. She told the Guardian during the summer, “I am very interested in post-colonial theory, black literature and post-black literature.” Her Spring 2018 show was accompanied by an excerpt from an exhibition press release at The Artist’s Institute called Hilton Als: James Baldwin/Jim Brown and the Children, and a poem by Essex Williams . She explored black masculinity, bearing in mind observations from the exhibition. 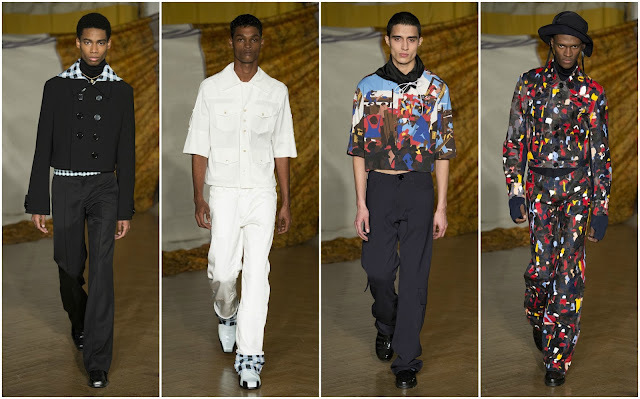 Her latest outing, presented on a chilly Sunday evening, on the second day of London Fashion Week Men’s, continued in a similar vein with a noteworthy art reference. African-American painter Jacob Lawrence painted a 60-panel Migration Series on cardboard in the 1940s. He garnered critical acclaim and national attention in the epoch for his cataloguing of the Great Migration, when 6 millions African-Americans moved from rural Southern states to the North post-World War I. Some of the paintings were visible in the collection with hand-painted renderings on garments. Therein lies the commercial gambit but it speaks much louder than that. The premise of the collection was around migration. Quotes such as “a black sailor returning to land” and “the port as a site of exchange of transgression” were noteworthy ascription supplemented at the show at Grosvenor Place. The ongoing narrative around the migrant crisis picked up many years ago in the advent of the Syrian War, when displaced migrants moved to mainland Europe and faced the xenophobic and racists attitudes of many doltish citizens who saw no place for immigrants in their society. The 1940s, when Lawrence’s paintings were set, were a time when the subject of immigration was also making headlines. During and post-WWII, the disenfranchised, the displaced and the destitute were scattered across Europe. The decade was reflected in the tailoring which avoided (as Karl Lagerfeld bowed to with his 60s-inspired ode to Hamburg) the tropes of a sailor’s wardrobe; in lieu of that Ms. Wales Bonner paid tribute to the decade where sumptuous masculine tailoring was in fashion. Her casting stands out for its approach to casting mostly non-white models, turning the tables on an industry which fails to represent ethnic minorities. Moreover, one noticed again how alarmingly thin the models were. While it opposes the stereotypical vision of black masculinity—virile and of Herculean proportions—with unisex and decorative outfits, one questions whether this is the vision of manhood that should be propagated. In the context of what it stands for, perhaps it is a refreshing perspective, but in a wider sense, it may over-subscribe to fashion’s preconceived attitudes towards sizing. At a sparse London Fashion Week Men’s, now shortened to a three-day affair, a brand like Wales Bonner rises to the top. It may have been a few short years, her rise meteoric, but she is a distinguished young woman designing intelligent, thoughtful menswear. 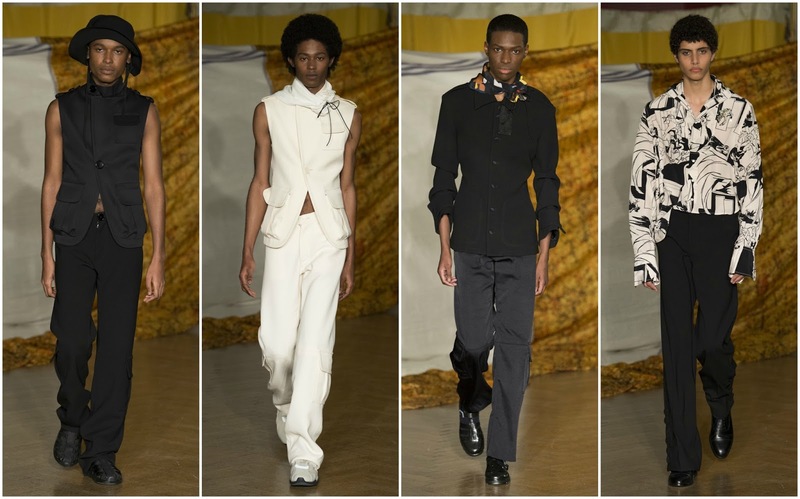 Never has there been a deeper understanding of the intersection between blackness and masculinity, and never has a designer accumulated the attention she’s got, in terms of educating the fashion industry on black culture.